Formfutura EasyFil Light Blue ABS is a beautiful sky blue-coloured filament and 100% opaque. Objects printed in 3D with EasyFil™.Light Blue ABS has a fresh and cheerful appearance. 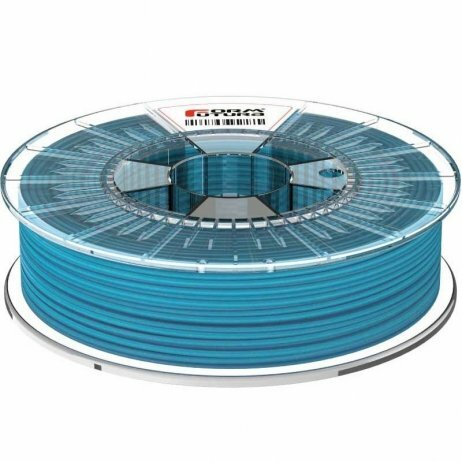 Comes in a transparent 750g spool. 28,95 € Tax incl. 24,13 € Tax excl. FormFutura filaments are opaque and have a regular diameter. This ABS is designed for minimum peeling (warping) and virtually no deformation during cooling. FormFutura is an extruded filament brand in the Netherlands and has been present in the world of FDM 3D printing for the last two years. Check out the full range of PLA/ABS in our store. Formfutura EasyFil™ Magenta ABS is half-way between pink and purple and is 100% opaque. 3D objects printed with EasyFil™ Magenta ABS are cheerful and fun. Comes in a transparent 750g spool. Formfutura EasyFil™ Dark Blue ABS is a navy blue colour and is 100% opaque. 3D objects printed with EasyFil™ Dark Blue ABS have an opulent, sophisticated look. Comes in a transparent 750g spool. Formfutura EasyFil™ Dark Green ABS includes hints of turquoise and is 100% opaque. 3D objects printed with EasyFil™ Dark Green ABS give your 3D prints a natural feel. Comes in a transparent 750g spool. Formfutura EasyFil™ Orange ABS is an intense, deep colour and is 100% opaque. 3D objects printed with EasyFil™ Orange ABS are shiny and bright. Comes in a transparent 750g spool. Formfutura EasyFil™ Yellow ABS is an intense, vibrant colour and is 100% opaque. 3D objects printed with EasyFil™ Yellow ABS are intense and sophisticated. Comes in a transparent 750g spool. Formfutura EasyFil™ Grey ABS is an intense metallic colour and is 100% opaque. 3D objects printed with EasyFil™ Grey ABS have a robotic, futuristic look. Comes in a transparent 750g spool.